Summer is right around the corner. The warm sun shining while you enjoy a delicious meal from the grill. Can you picture this? Since summer will be here before you know it, let’s make sure your backyard is safe. Then you will have peace of mine and take full advantage of the gorgeous weather! Making those delicious smoky steaks has most likely been on your mind as we approach grilling season. The backyard parties would be nothing without the food, right?! First, let’s make sure your cooking station is properly maintained and safe for you and your guests. – Before you light the flame, it is important to make sure your grill is working properly. Most of us don’t actually take time to do this, but be sure to check the hose connecting the grill to the fuel tank. It has most likely been stored in the garage or outside for months without being used. There is potential for a buildup in the hose or even a leak. Take a few minutes to inspect it for damage before each use. – This might sound obvious, but don’t leave the grill while cooking. I know there is usually a whole lot of multi-tasking to be done while grilling, but have some friends help you with those other things. There is always a potential for the flame to get out of control. If you stay close and have a fire extinguisher nearby, you can catch it before it gets out of control. Make sure the yard is completely clear of any objects that could be tripping hazards or cause injury. The kids will want to get out and play the first chance they get, but safety first! – Fill in all the holes that could have been left from dead plants and trees or even a hole your dog decided to dig. A broken or sprained ankle from stepping in a hole is certainly no way to start your summer. – Now that the holes are filled, time to have the most beautiful lawn on the block! Be particularly careful using weed killers and pesticides. Make sure to wear protective glasses and other safety gear before attacking the weeds. Also, do not spray around pets or children and use the suggested amount listed on the bottle. Set some summer safety rules in place and make sure your guests know them as well. Being the owner of a backyard swimming pool may involve a little more responsibility than you think. – We know the basics like no running on the pool deck and no diving into shallow water, but there’s more. Make sure there is never a lonesome swimmer, anything can happen at any moment. Unfortunately drowning happens more than it should, make sure this doesn’t take place at your pool. It can be easily avoided by always having a swimming partner or someone on watch. No matter the age or experience level, you should always swim with a buddy. – Another responsibility of a pool owner is to make sure the chemical levels are tested often and maintained properly. Dirty pools can cause recreational water illnesses such as infections and rashes. You don’t want your guests coming down with something like this after swimming. That will surely keep people away from your next pool party! Take time to make sure you, your friends, and your family will be safe during all of the fun backyard activities. 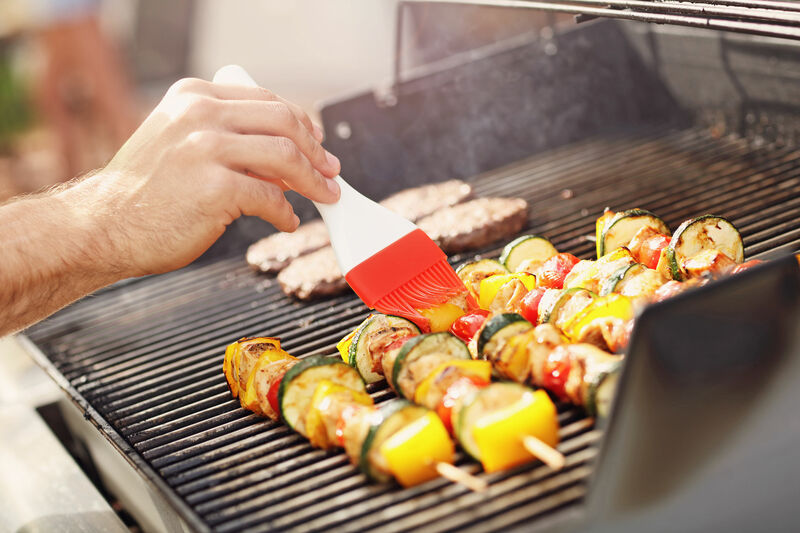 After the backyard is completely hazard proof…fire up the grill, mix a nice cold drink, and relax knowing you took the precautions necessary to have a fun and safe summer!